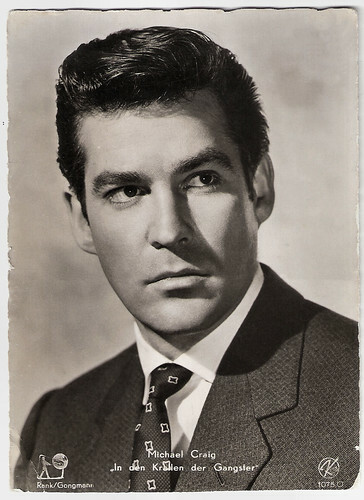 British actor Michael Craig (1928) is known for his work in theatre, film and television both in the United Kingdom and Australia. He also worked as a scriptwriter, such as for The Angry Silence (1960). In Italy, Luchino Visconti directed him in Vaghe stelle dell'Orsa.../Sandra (1965). Belgian collectors card by Merbotex, Bruxelles. Photo: Arthur Rank. Michael Craig was born Michael Francis Gregson in Poona, British India, in 1928. He was the son of Donald Gregson, a Scottish captain in the 3rd Indian Cavalry. He came to Britain with his family when aged three, and went to Canada when he was ten. He left school for the Merchant Navy at 16, but finally returned to England and the lure of the theatre. By 1947, he debuted on stage in The Merchant of Venice. Craig's film career started as an extra in the Ealing comedy Passport to Pimlico (Henry Cornelius, 1949). In 1953, he gained his first speaking part in the British war film Malta Story (Brian Desmond Hurst, 1953). This eventually led to discovery by the Rank Organisation. 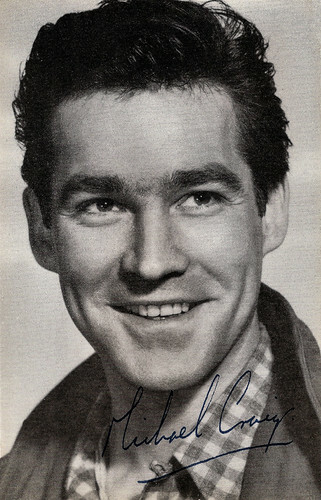 Craig was groomed for stardom, and leading roles followed in such films as Yield to the Night (J. Lee Thompson, 1956) opposite Diana Dors, Campbell's Kingdom (Ralph Thomas, 1957) with Dirk Bogarde, Sea of Sand (Guy Green, 1958) starring Richard Attenborough, The Silent Enemy (William Fairchild, 1958), Upstairs and Downstairs (Ralph Thomas, 1959) with Mylène Demongeot, and the comedy Doctor in Love (Ralph Thomas, 1960). The Angry Silence (Guy Green, 1960) starred Richard Attenborough and Pier Angeli. When his 7-year contract with Rank ended, Craig was optioned by Columbia Pictures. Yet his American work was only remembered in two films, ironically co-productions, either with the UK, Mysterious Island (Cy Endfield, 1961), or Australia, the Disney TV instalment, Ride a Wild Pony (Don Chaffey, 1975). He often worked in Italy and his faraway best Italian film is Vaghe stelle dell'Orsa.../Sandra (Luchino Visconti, 1965) with Claudia Cardinale and Jean Sorel. Other interesting films include Modesty Blaise (Joseph Losey, 1966) featuring Monica Vitti, Star! (Robert Wise, 1968) with Julie Andrews, Turkey Shoot (Brian Trenchard-Smith, 1982), and Appointment with Death (Michael Winner, 1988) with Peter Ustinov and Lauren Bacall. British autograph card. Photo: Rank Organisation. Austrian postcard by Kellner-Fotokarten, Wien, no. 1075 Ö. Photo: Rank Organisation. Publicity still for House of Secrets (Guy Green, 1956). 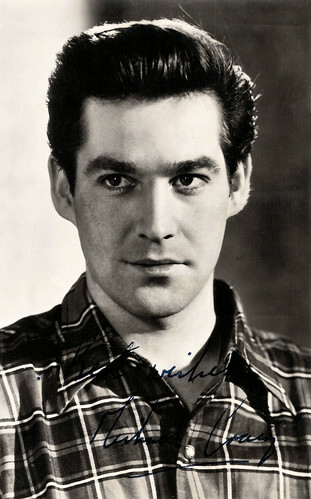 Michael Craig first job in the theatre was as an assistant stage manager at the Castle Theatre, Farnham in 1950. In 1953, Sir Peter Hall gave him his first lead role on stage. His many later stage credits include A Whistle in the Dark (1961), Wars of the Roses (Season at Stratford 1963-1964), Jule Styne's musical Funny Girl (with Barbra Streisand at the Prince of Wales Theatre 1964), William Shakespeare's play Richard II (1965), The Homecoming (1966–1967) and the lead role in Trying in 2008. His television credits include appearing in Arthur of the Britons (1973), The Emigrants (1976), Rush (1976), The Professionals (1980), Shoestring (1980), The Timeless Land (1980), Triangle (1981–1983), Tales of the Unexpected (1982), Robin of Sherwood (1986), and Doctor Who (1986). 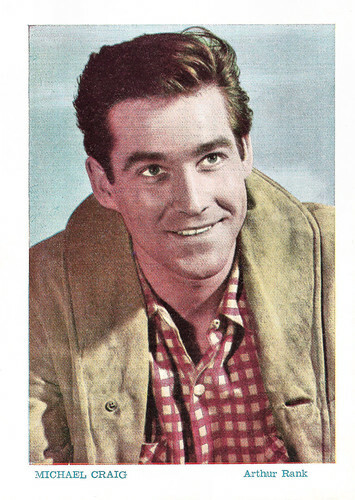 By the mid-1970s, Craig's TV and film work was heavily concentrated in Australia. He played a depth or roles, both comedic and dramatic, that has included memorable and solid character pieces as he has matured in age. His Australian series include G.P. (1989–1995), Brides of Christ (1991), Grass Roots (2000) and Always Greener (2003). Craig's scriptwriting credits include the highly acclaimed ABC-TV trilogy The Fourth Wish (1974), which starred John Meillon in his award-winning performance as the father of a dying boy. He also wrote the screenplay for the feature film of The Fourth Wish (1976), which was produced following the success of the television series. 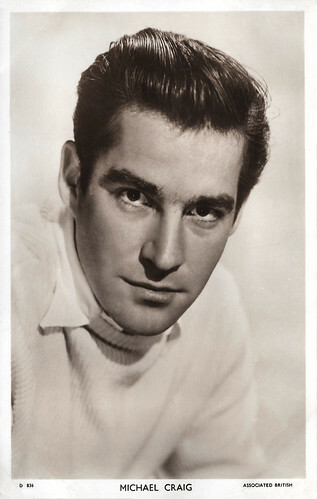 Alongside his brother, Richard Gregson and co-writer Bryan Forbes, Craig was Academy Award nominated for his screenplay of The Angry Silence (1960). Twice married, his first wife was Babette Collier, second is Susan Walker. He is the father of Michael, Stephen and Jessica Gregson. Michael Craig resides in Australia. His brother is film producer Richard Gregson, and from Richard's marriage to Natalie Wood, he is the uncle of actress Natasha Gregson Wagner. In 2005 Craig released his autobiography The Smallest Giant: An Actor's Tale. British postcard in the Celebrity Autograph Series by Celebrity Publishers London, no. 298. Photo: Rank Organisation. Publicity still for Campbell's Kingdom (Ralph Thomas, 1957). British postcard in the Picturegoer Series, London, no. D 836. Photo: Associated British. Sources: Hal Erickson (AllMovie), William McPeak (IMDb), Wikipedia and IMDb.